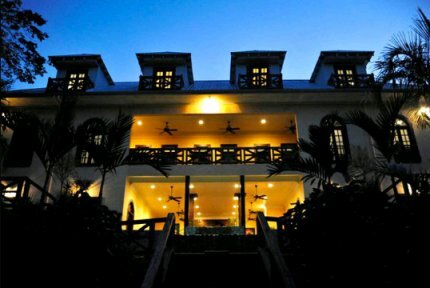 Mahogany Hall Luxury Boutique Resort in Belize! Bid per Room per Night and Stay One (1) Night! Crow's Nest Suite | Deluxe Suite. Located on the banks of the Mopan River, our boutique resort is both a serene and scenic place for guests to rest in between tours or just lounge around with a good book. The quaint community of Bullet Tree is slow-paced though only a five minute drive from the bustling town of San Ignacio. Whether you are in your room, on our hardwood veranda, on the banks of the Mopan River or by the pool you will enjoy being relaxed and pampered as our friendly staff caters to all your needs. We focus on bringing you an unsurpassed level of service in an elegant and comfortable setting. Our Eco-friendly Resort is peaceful, quiet and magnificent, ideal for kicking back or taking an adventure tour of the Mayan under world, explore the famous Actun Tunichil Muknal or the mystery behind the Mayan Temples such as Caracol, Xunantunich and Tikal just to name a few. Discover all the adventures of the tropical rainforest unfolding before your very eyes. Go for a walk along the banks of the Mopan River, horse-back riding, canoeing or river tubing and enjoy a wonderful Bird watching experience, enjoying all of the rarely seen exotic birds like the Keel-Billed Toucan (Ramphastos Sulfuratus), Ringed Kingfisher (Megaceryle torquata), Striped-tailed Humming Bird (Eupherusa Eximia), Grey-fronted Dove (Leptotila Rufaxilla), or the Great Kiskadee (Pitangus Sulphuratus) naming only a few of many birds found here in Belize. Get intrigued in knowing our beautiful land and what it has to offer you. During your stay with us, we want you to experience a Belize Vacation like no other, so in the future when you think Belize you think Mahogany Hall. The big doors of our Mansion are wide open awaiting your arrival! Mahogany Hall Luxury Boutique Resort "OUTSTANDING IN EVERY ASPECT"! 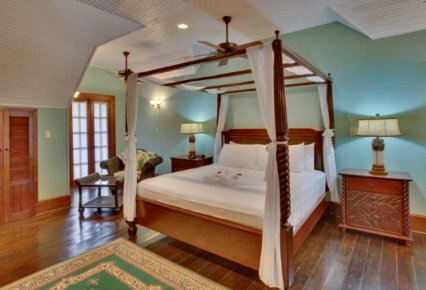 Belize suites at Mahogany Hall are accentuated with mahogany wood furnishings, high ceilings and large windows that open up to a private balcony. A picturesque view of mist covered mountains can be seen from the front balcony, while the two rear balconies provide a scenic view of the flowing river and lush tropical plants below. The deluxe Jacuzzi tub and shower in the large private bathroom adds a touch of romance and luxury. Our suites are perfect for couples on a honeymoon with nightly romantic candlelight turndown service with candles, chocolates and tropical flowers. Offer is based on double occupancy in a Crow's Nest Suite or Deluxe Suite. A tax and service charge of $59.oo per night is additional.